The White Layer was developed several years after the Gold Star Hybrid after many of our customers requested a a white egg-laying duck. 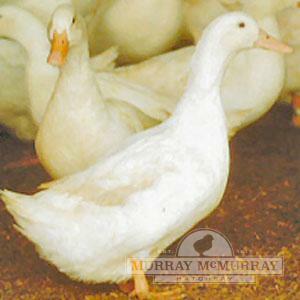 White Star Hybrid ducks are foragers and very good layers — averaging 230-290 eggs per year. 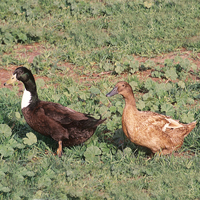 These ducks have equal egg production to the Gold Star Hybrid. All of the progeny of the White Layer are white. They will average 4-6 pounds when fully grown. Is this bird a medium weight bird? Is it a flying bird? 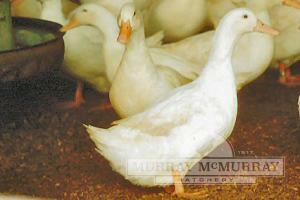 The White Star Hybrid duck averages 4-6 pounds. They are excellent layers, and generally do not fly. 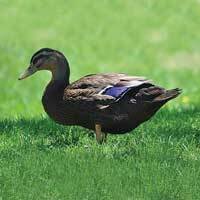 Ducks are considered mature around 6 months of age. What age do they start laying? 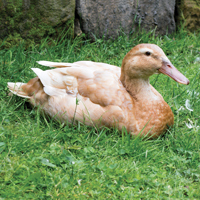 White Star Hybrid ducks will begin laying around one year of age, and will lay each year. However, each year's production is less (10-15%) than the year before. Are these ducks friendly to people? Will they get along with other types of ducks and poultry? Are they flighty and nervous? Or are they more calm and gentle? 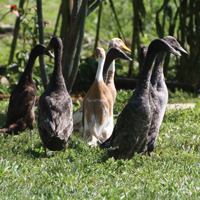 The White Star Hybrid ducks do have a calm disposition. Each one can have their own personalities, but should be just fine with people and with other poultry. White starsVery friendly personable ducks. Amazing egg production. I I'll order more!